Sindy Sterckx works as a researcher in the Remote Sensing department. 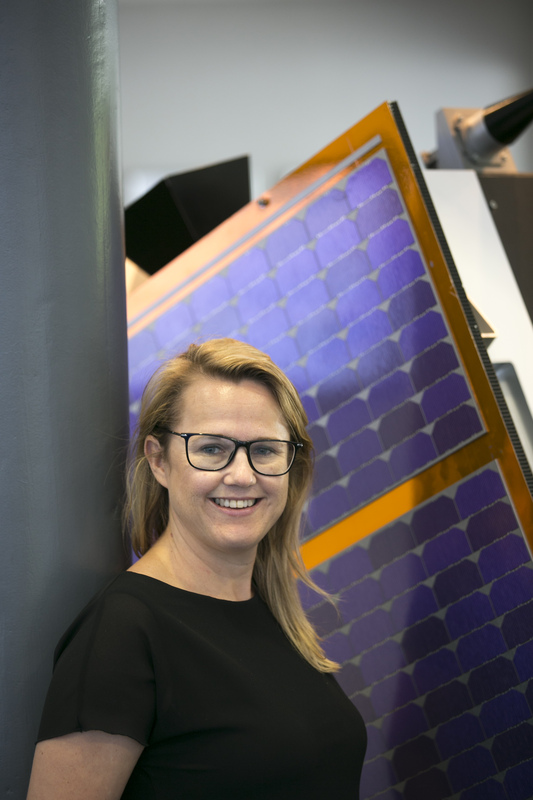 She calibrates camera sensors and processes images generated from space and from the air, including from the Belgian ‘microsatellite’ PROBA-V, balancing the technical side of her work with providing service to end-users. "I am familiar with both the algorithms behind the image processing and the various applications of remote sensing, such as monitoring vegetation or mapping water quality. You have been working at VITO since 2002. A substantial part of your career coincides with the PROBA-V mission. That’s right. We have been working with PROBA-V for over eight years now. The satellite was launched in May 2013, but in the years before that, we were involved in planning and preparing the mission. PROBA-V is an earth observation satellite that takes images of the entire land mass of our planet every day. The images are used for example to monitor the development of the Earth’s vegetation. What is crucial here is that we continuously calibrate the camera sensors, so we can be certain that the images are stable and that there is no degradation. This is because we need to be absolutely certain that any differences we notice in the images are actually due to changes in the vegetation (as a result of global warming, for example, ed.). During a radiometric calibration of this kind, we briefly point the satellite at the moon or at the oceans, and then apply correction factors if necessary. To do this, we send commands to the control station in Redu where the satellite is constantly monitored. In addition to the calibration, I am also involved in processing the images so our end-users have access to correct and usable data. I also do this for other satellites and remote sensing applications. The number of satellites orbiting the Earth is growing exponentially. How do you make sure that from all this data the correct information is gathered? Correct! It is indeed a challenge to deduct the information you need from the huge amount of data. Therefore it is crucial that the data collected from different satellites are harmonized (we make the data "consistent"), so that we maximize the outcome from a combination of satellites. In addition, we can combine satellite data with data from airplanes/drones. We develop specific algorithms or use techniques like artificial intelligence. We provide all this information on online platforms for use in the agricultural sector for example. After graduating as a bioengineer at KU Leuven, you spent two years working on an academic project on remote sensing. How do you think that differs from your job at VITO? University research is always done at quite a fundamental level. At VITO, we focus more on the usability of the results and how they can be valorised – possibly by external partners. What’s more, we have more and better facilities than a university. Staff turnover is also lower, which helps if you are used to working in a team. You also sit on a panel of the European Space Science Committee (ESSC). What does that involve exactly? The ESSC is an independent body that advises on the various space programmes and missions of among others the ESA and the European Commission. I am part of the Earth Sciences Panel along with five other scientists, and we focus on Earth observation. At the six-monthly meetings, we ensure that there is sufficient scientific and research basis in the space programmes.